Leading a Call to Action. 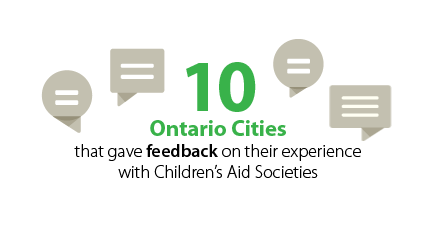 In 2015–2016 local Children’s Aid Society Boards and their staff made a formal commitment to work as a provincial system to continue to improve the quality and consistency of services to children, youth, and families across Ontario. 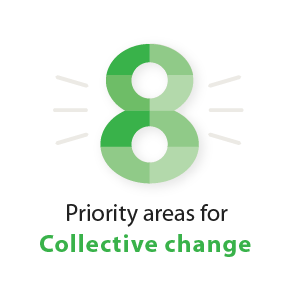 The child welfare sector also committed to communicating about the changes arising from the Call to Action in a transparent and accountable way. 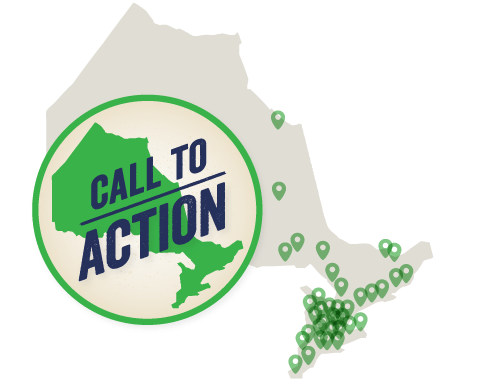 The provincial Call to Action represents a significant turning point for child welfare in Ontario. Collaborating to improve the health, well-being and life chances of Aboriginal children. The drumming and singers at sundown was my favourite moment at the Bark Lake Indigenous Youth Conference. Creating and administering a survey on restoring jurisdiction, to capture in a quantifiable way the sector’s baseline in its path towards reconciliation that will demonstrate to Indigenous communities that the child welfare sector is taking reconciliation seriously. The survey is based on the OACAS Reconciliation Framework and looks at the nature of agency partnerships with communities and the services delivered to families. Hosting the Bringing Our Minds Together Think Tank with guidance from a steering committee that included Indigenous stakeholder representatives and that brought together Indigenous representatives and OACAS Board Members and staff to talk about actions OACAS might take toward acknowledgement, apology, and reconciliation by child welfare in Ontario with Indigenous peoples. Supporting member agencies as they transitioned to CPIN. The Child Protection Information Network (CPIN) modernizes child welfare by introducing a consistent approach to collecting information across the province. 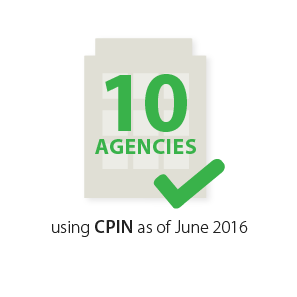 In 2016 five new agencies relinquished their legacy systems and transferred millions of files to join CPIN, bringing the number of agencies that have joined CPIN to 10. This will be the first time in Ontario’s history that child welfare is using a common information system. 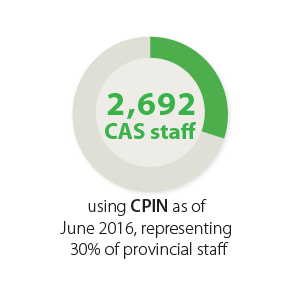 OACAS support for agencies transitioning to CPIN includes providing a liaison between the field and the Ministry of Children and Youth Services to promote the development of the best product and ensure effective implementation of CPIN. In 2016 OACAS continued to provide support to agencies “going live” as well as to agencies that implemented CPIN last year and are now in the sustainment phase. OACAS is also an active member in the governance of CPIN. Engaging youth and former youth in care. 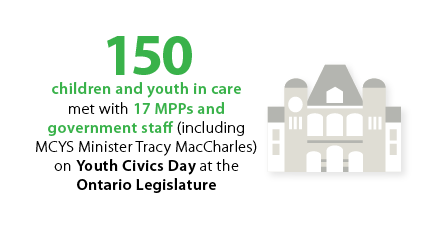 This year OACAS continued its active support of youth in care in recognition that their input is essential to improving the child welfare system and that transitioning out of care is one of the most challenging experiences youth will face. I have changed as a person for the better in a matter of about two days. Supporting a presentation by the Youth Policy Advisory and Advocacy Group (YPAAG) to the senior leaders of Children’s Aid Societies from across the province on the 10 ways youth want to see the child welfare system improved. 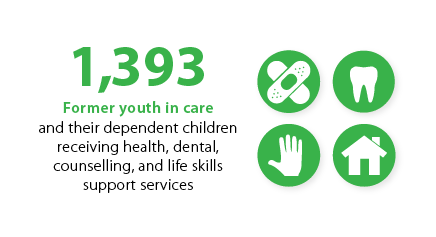 In 2014 OACAS launched the Aftercare Benefits Initiative to provide health, dental, counselling, and life skills support services to former youth in care aged 21 to 25. In 2015–2016 enrollments grew to a total of 1,393 plan members, including children of former youth in care. Building a new Child Welfare Training series as a pathway to authorization for all workers. 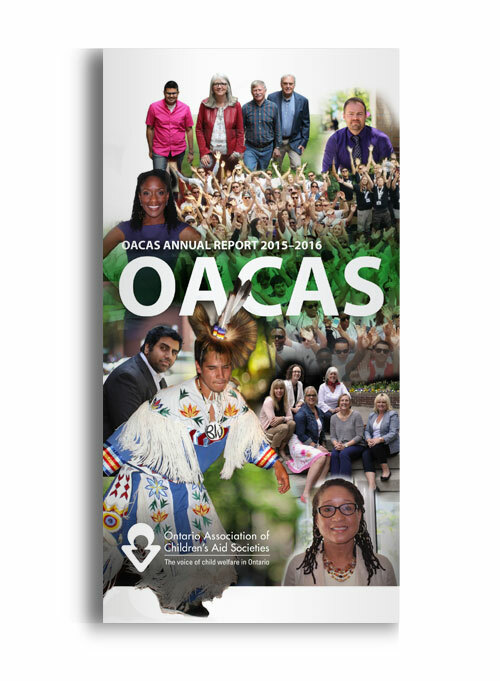 In 2015–2016 OACAS redesigned the training curriculum for child welfare professionals. This curriculum is a key pillar in the development of a new process to authorize child welfare workers across the province. The curriculum will reflect the child welfare realities in Ontario using an anti-oppressive framework, which includes topics on equity, human rights, and anti-racism, and a focus on Indigenous content. Authorization will be dependent on child welfare workers completing the new foundational learning process, which includes theory, practice, assessment throughout, and an exit exam. We want to make sure that child protection workers have the very best training so that they can do the best work with the children and families that we serve. The learning program for child welfare workers consists of a competency-based framework that provides new workers with foundational knowledge. The curriculum will be spread over eight courses and 120 hours of instruction using a hybrid format: learning will include both in person and online content. Assessment and evaluation of the curriculum has been integrated into all the courses. Supporting agencies to publicly report agency-specific performance indicators. 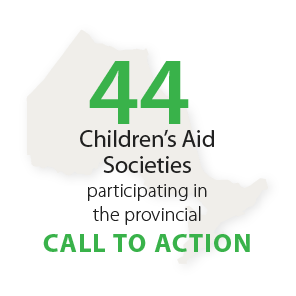 Through the Provincial Performance Measurement and Management Project, Children’s Aid Societies have taken an important step to enhance their accountability and commitment to better outcomes for the children, youth, and families they serve. 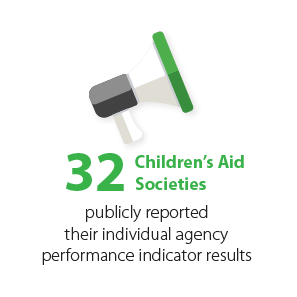 This year, for the first time, Children’s Aid Societies publicly reported their individual performance indicator results for five service areas. This year we increased our understanding of our performance indicator results and how they connect to better outcomes for children and youth. Leading the development of a business case for shared services in the child welfare sector. 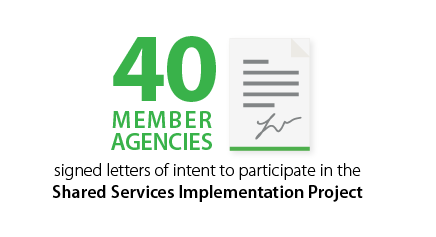 In 2015–2016 OACAS and its members finalized and submitted a Business Case for Shared Services in the child welfare sector to the Government of Ontario for funding consideration. The overall goal is to implement a program that builds sector capacity, improves service quality and performance, reduces costs, and enhances Ontario’s child welfare system. 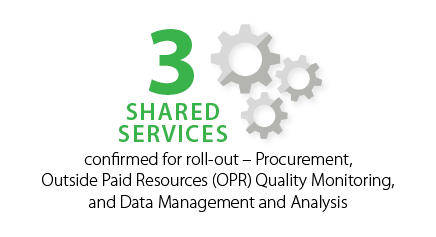 The business case for Shared Services shows the sector’s commitment to building a more efficient and sustainable child welfare system. Collaborating to improve outcomes for African Canadian children and families. One Vision One Voice: Changing the Child Welfare System for African Canadians is a project by the African Canadian community, funded by the Ontario Ministry of Children and Youth Services through OACAS, to develop a strategy to improve outcomes for African Canadian children and families who come into contact with the child welfare system. 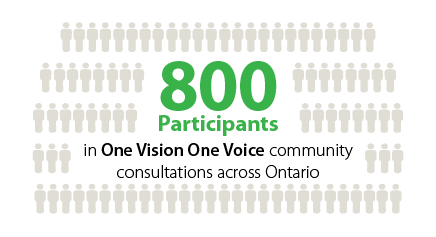 In 2015–2016 the project conducted 16 community consultations across the province to hear from individuals about their experience with the child welfare system. The purpose of the consultations is to lay the groundwork for developing a guide for child welfare staff on how to best serve the African Canadian community in Ontario. The only way to improve services is by intricately understanding the reality of the people we work with. It gave us the opportunity to speak freely about our experiences as African Canadians working in the system.